There's no $100 million-plus surprises awaiting in this weekend's box office (I don't think), but we do have a weekend chock-full of new films ranging from action to comedy to romance, and each utilizing their own definitions of star power. 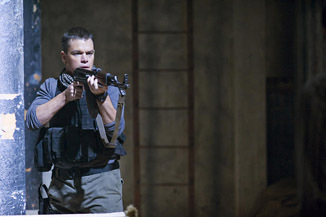 Green Zone leads, the way, directed by Paul Greengrass and starring Matt Damon. That pairing should be familiar to most action fans as the one responsible for the last two Bourne films, and the ones responsible for turning that franchise into one of the bigger one of the last decade. After talks about a fourth Bourne film broke down and with Greengrass admitting he didn't have any strong ideas for another film, they've moved on to a different plan. Movies about the Iraq War and/or terrorism have at best been minor box office hits, with the odd critical darling in the mix that audiences ignored. The Kingdom (only tangentially about Iraq) and The Hurt Locker have really been the only two notable successes. In the case of the latter, it's only after a huge push by guilds and critics' organizations, and it will probably earn most of its money through DVD sales. Green Zone brings a potent combination of star power and action that we haven't seen in a movie of this type recently. Lions for Lambs had Tom Cruise but little action; The Kingdom had lots of action but only mid-level stars. The biggest question for this film is whether the public's attitude to films about Iraq has changed – or was it just that the films that we did make about them were overly preachy and boring?